Keypad locks can bring extra security to your business. Commercial facilities often have much more extensive security features than typical homes do, including high-security locks, restricted-access security systems, security gates and more. Performing locksmith services on these types of locks require much more technical expertise. Here at Lock Dawg, we are proud to work with businesses throughout Central & Northeast Georgia for all their locksmith service needs. We have been in this business for many years, and that experience has given us unique insight into the specific security needs of commercial enterprises. 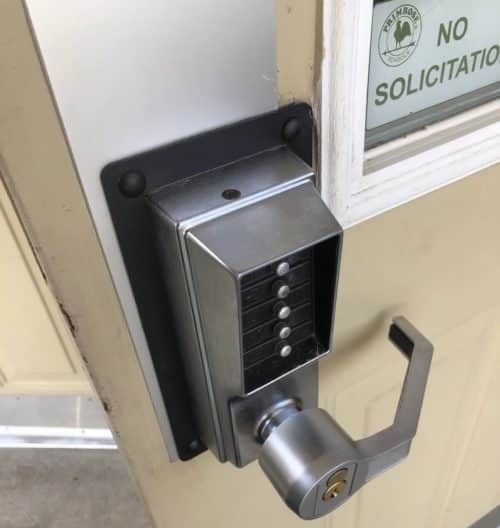 We can handle a wide range of tasks in this area, ranging from simple key duplication to far more complicated jobs, like installing panic devices, crash bars, deadbolts, storefront door locks, and other security measures. If you know exactly what your business needs, we’ll be happy to get to work right away. If you are still debating as to which security solutions are best for your organization, that’s perfectly fine too. We’ll work with you to understand the specific needs of your company so that we can recommend the most appropriate security measures to meet your needs. Even if you have no idea where to start, we can help you figure out what makes the most sense. It is only natural for commercial organizations to be concerned about the security of their products, confidential information, including trade secrets, client lists, accounting records, and even where cash is stored. Our commercial locksmiths always work with our customers with integrity and discretion. All proprietary information is safe with us. We are fully certified, registered, and insured. We welcome the chance to provide your company with any security and locksmith service needs. We’ll even come to you with our mobile locksmith service. No matter where in Northeast Georgia you’re located, we can dispatch a commercial locksmith to your location. Our mobile locksmiths are fully equipped to handle your needs. You may not be able to predict when you’ll need a locksmith, but you can have confidence that you always have one at the ready when you work with us. Get in touch with us today to learn more about our commercial locksmith services so that we can tell you more about the many ways we can help your organization. We’ll answer any questions you have before getting started so you can confirm that you have made the right choice.